The Scottish Independence Referendum that failed to achieve popular democratic approval Sept. 18, 2014 provides conversational fodder as we consider the future of governance in the United Kingdom, Europe and around the world. With wicked globalized challenges, such as international tensions, public health, economic recovery and climate change, the role of nations in addressing transboundary issues will be a critical debate for the 21st century. Although much of the discussion on the Scottish referendum was related to its domestic situation, division of states would have a complex array of benefits and drawbacks in the future of global public policy. 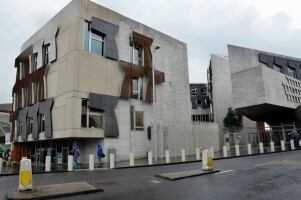 On Aug. 6, 2014, I visited the devolved Scottish Parliament Building in Edinburgh and watched from the gallery as the members discussed the future of nuclear weapons in Scotland. While there was debate about the upcoming referendum embedded into the talking points, there was general opposition to the Trident programme and the housing of British nuclear submarines in Scottish territory. An independent Scotland might have favored removing its nuclear capabilities or used its aversion to such weaponry to gain other concessions from the rest of the United Kingdom in negotiations over economic, security and other matters a decision for independence would have necessitated. While the splitting of nations has the potential for conflict, smaller independent countries might also lead to reduction of military resources as the smaller economies and closer relations between citizens and government could shift allocations away from defense spending or encourage further cooperation between like-minded military forces. Regardless, an independent Scotland, Quebec, Catalonia or even Texas would need to decide upon national security budgets from a different perspective. This could present risk from decentralized responses to terrorism or allow for nimble, flexible forces leveraging resources from multiple nations to meet contemporary challenges in a new global security regime. Terrorism is not the only threat to global health and well-being. In our interconnected world, a contagious affliction like the Ebola Virus can threaten everyone’s long-term survival. While smaller industrialized countries could create obstacles in the global public health community, it may be time for administration of such programs to move beyond these obstacles. Independence movements or not, Doctors Without Borders may need to be not just one non-governmental organization, but rather the future of medical governance. Shifting economies beyond borders in a world of smaller states could have proven to be an even bigger challenge for central bankers and economic planners. The failures of the European Union managing its currency in the wake of the ongoing global financial crisis shed a new light on the difficulties of ameliorating struggling economies across borders. While the free flow of labor and capital reduces transaction costs in the functioning of worldwide marketplace, lack of national regulation of money and economic activity is a risky proposition. Bitcoin may have a future in the global financial system, but it was not closely considered as the next currency for an independent Scotland or any nation, large or small. The most global of all challenges, a commons problem that affects the entire planet, are climate change and negative anthropogenic impacts on the environment. Although protecting fossil fuel interests was a goal of the Scottish National Party and the independence proponents in Scotland, an independent Scotland could have also served as a model for a clean energy society. Renewable resources generate a significant portion of Scotland’s electricity portfolio and the energy efficiency and renewable energy sectors are a growing proportion of Scottish employment. While an independent Scotland would not have necessarily meant a greener British Isles, polycentric approaches to climate change mitigation allows for smaller governmental units to meet targets and design programs that maximize local comparative advantages in coordination with international efforts. Smaller, more efficient, more responsive public sector institutions can potentially better serve the needs of future generations in a lower carbon society. The decision to split from the rest of the United Kingdom after 300 years of shared public administration would have created a series of contentious decisions in establishing a new Scottish state. Much of these discussions, however, will still occur in response to constitutional reform in Great Britain and Northern Ireland, with further devolution of power to the Home Nations. As these dialogues continue, however, it is important that public administrators understand the external implications of national divisions and independence movements. For voters and policymakers in these regions the metrics for their choices are domestic. As these movements continue and other international challenges emerge, the world could be both separating into smaller units at the same time our planet becomes ever more interconnected. Despite the inherent contradiction of this situation, it could represent a paradigm shift in how we and future generations govern ourselves. Public administrators and policymakers of the future will need to be able to look inward and outward in designing programs and policies to meet these future needs. The defeat of the independence referendum in Scotland eliminated an opportunity to witness and study these changes. However, it also allows an opportunity to study these implications before they re-emerge on the agenda in another generation. Author: Benjamin H. Deitchman, Ph.D. MPA, is a visiting assistant professor of public policy in the E. Philip Saunders College of Business at the Rochester Institute of Technology. You can email him at [email protected] or follow him on Twitter @BHDRIT (http://twitter.com/bhdrit).